We would all miss the ladies of the Altar Guild were they not there, yet we seldom think of them. While we sit in our pews during mass, we rarely think of, or even know about, their silent, unseen, and diligent work. And yet they are always there attending the Lord's Table. 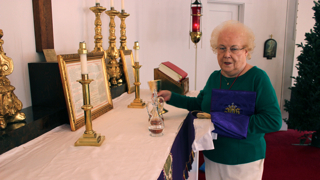 Katheryn Gordon can be seen each Sunday quietly going about the task of setting up the alter for mass and then cleaning the vessels after the service. Everyone she meets gets a cheery "good morning" and a bit of conversation. 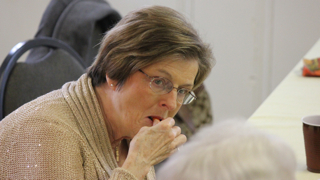 Judy Gibson is a invaluable member of the Alter Guild, with her attention to detail and her skill in planning and anticipating what the church needs. We really don't know how we would survive without the support of Judy and her husband, Dave. Donna Hall, while not officially a member of the Alter Guild, is one of those people without whom everyone would have to work a great deal harder. Her skill with the alter flowers is appreciated by everyone in the church. 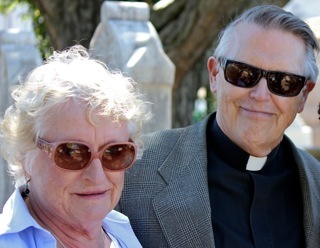 We are very thankful to have both Donna and Fr. Terry here at St. Hilda's.